Are there really people who would do this much decorating for a dinner party on Halloween? 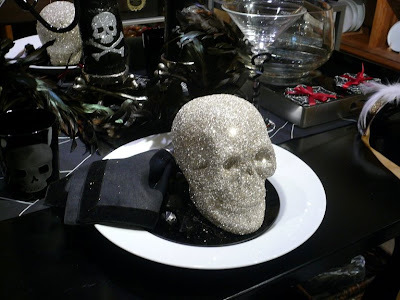 I took this photo inside a Pottery Barn store where an abundance of expensive Halloween ornaments, plates, napkins, candleholders, and other bric-a-brac were available for the inspired hostess. I know that some of my foreign readers don’t celebrate the holiday Halloween but, for those of you who do, have a happy and safe one. In the US there will be many trick-or-treaters knocking on doors dressed in costumes and hoping for candy at each stop. Parents will need to be prepared for the oncoming sugar rush! By the way, Halloween is a name that was shortened from All-Hallow-Eve or the eve of All Saints Day which is on November 1st. 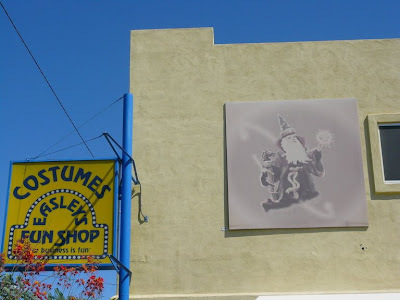 If you live in the Phoenix area, the place to go is Burt Easley’s Fun Shop. This shop has been a Phoenix fixture for 61 years. You can find costumes, masks, party favors, decorations, and much, much more. 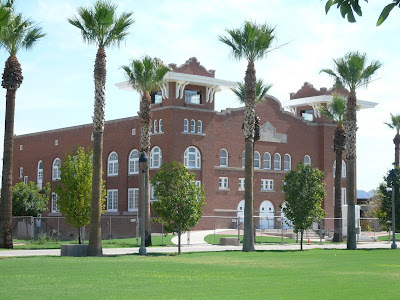 Tonight is the grand opening of Memorial Hall located at the Steele Indian School Park that I featured yesterday. 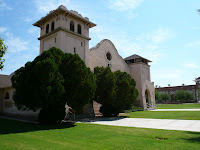 This is one of the three buildings that remain from the days of the Phoenix Indian School. 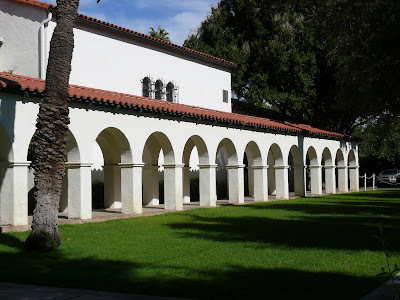 This Mission Revival style building also incorporates a Romanesque Revival look with the many arched windows. Recent renovations have brought the facility back to its original state. The facility is now open for rent for performances or meetings. Because of its outstanding acoustics it is ideal for musical and other artistic presentations. Sadly, I have another obligation and won’t be able to attend the grand opening celebrations. I'm sure I'll have a chance to visit it sometime in the near future. 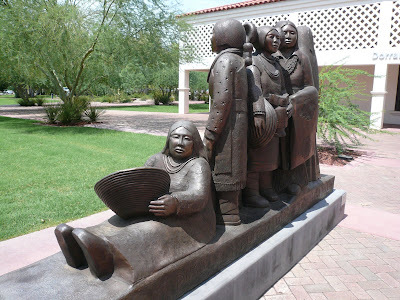 This park located in the heart of Phoenix covers 160 acres that was once the home of the Phoenix Indian School, an institution that closed in 1990. At it’s peak in 1935, over 900 students attended the Federally sponsored school and many of them made up the extremely popular marching band. 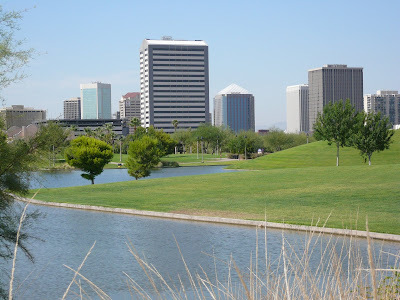 The City of Phoenix obtained the land in 1996 and along with a large donation from the Steele Foundation, developed the property into a beautiful park. This park features a dog park that is popular with local residents, an amphitheater that features “movies in the park”, 30 acres of rolling grass terrain, Bird Lake, three historic buildings that have been lovingly preserved, and beautiful gardens and fountains. 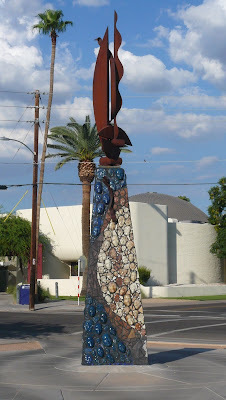 This joyful sculpture is located in the park next to St. Mary’s Basilica in downtown Phoenix. The bronze sculpture is by Gary Price and it was donated for use in this park by the parishioners of two other catholic parishes. The arched doorway behind it was preserved from the old St. Mary’s school that is long gone. It was placed here in honor of the Sisters of the Precious Blood who taught the children at the old St. Mary’s school. The small picture shows the view from the other side of that arched doorway. Picking the right pumpkin is not just an art, it’s an adventure. 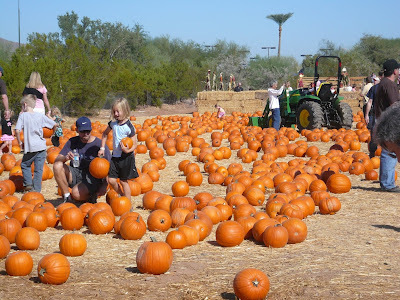 Every year, the Desert Botanical Garden has a two-day pumpkin festival with fun for all ages. A short hay-ride in the desert drops you off at the pumpkin patch but, you can only get there after skillfully making your way through the amazing hay bale maze. Once you arrive, you find the ground covered with pumpkins of every size and best of all, if you are under 12 years old, you get to take one home with you. It's a tough decision for those young ones. "Do I go for the big one that my dad will have to carry or do I get a small one that I can carry all the way home?" 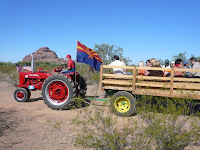 The small picture shows one of the many hay rides on its way back to the starting point to be serenaded with live music and enticed by the scent of Kettle Corn. I spotted this yard shrine when driving to meet a friend for lunch. My first thought was that this is phenomenon unique to the American Southwest and would be a good post for Phoenix Daily Photo. 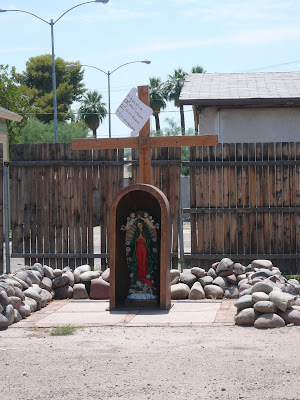 After I thought about it more, I realized that it wasn’t just common in Arizona; I’ve seen these little home-made shrines all over the country. I certainly remember several from the city in Illinois where I grew up. They might have looked a little different but, they were there none the less. These shrines might represent a petition for assistance or it could be thanks for prayers answered. It might be to commemorate some event or simply to honor a lost loved one. You can decide what this one represents. My Florist isn’t a florist at all, it’s a restaurant! 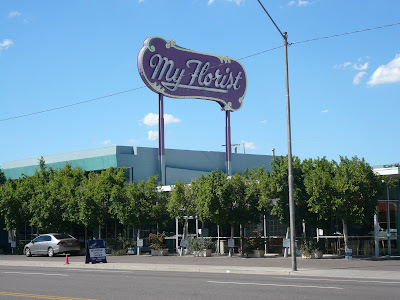 For 49 years from 1947 to 1996, this building housed a florist that went by the name of “My Florist” and it sported this huge neon sign high above the building. The owner of the florist shop, Vada Schwartz was quite a character who made people laugh with her antics. You can read a little about her here. When the new owners bought the place with a restaurant in mind, they decided to keep the name and the sign. Large and high glowing signs like this are prohibited today but, the ones that already exist can remain just as they are. This is a charming little restaurant serves salads, sandwiches, and wonderful bread fresh from its neighbor the Willo Bread Company. The dining room sports a huge grand piano that is played by a fiery piano player on most evenings. You can hear a little of her playing on the "My Florist" link above. Yesterday JM of Oeiras and environs daily photo honored me with a BFF (Blogging Friends Forever) Award. I am very honored, indeed. Sometimes an emergency services unit has its own emergency! Here’s the evidence. 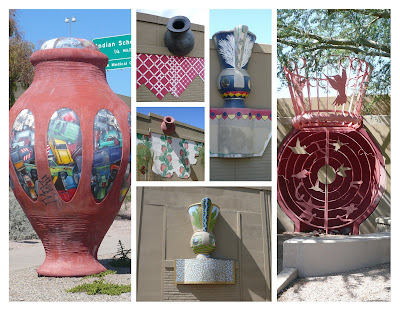 In September, I featured a story about 1980’s arts project to add a series of artist designed pots along a stretch of new highway inside the city limits. You can read all about it here. I found more remains of those pots in a variety of places along the sound-barrier wall of the freeway. Here is a grouping of the ones I have found so far. This building is next door to the house for rent that I posted yesterday. The buildings on this street are boarded up but, they don’t appear to be abandoned. Possibly they are being used for storage. I wonder if these buildings used to house businesses or if they were residences at one time. 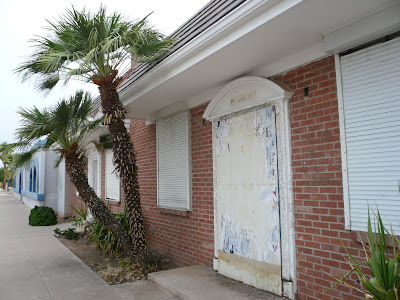 If you are looking for house to rent on the edge of downtown Phoenix, this might be for you. 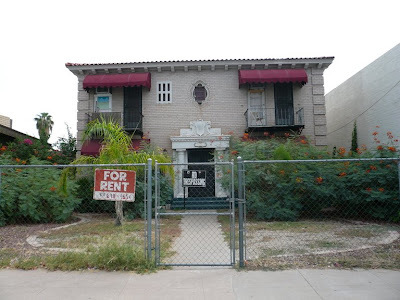 This house is quite literally wedged between some buildings on a side street on the edge of downtown Phoenix. Its architecture, while appealing seems very foreign to this area. It does appear to be in less than perfect condition making me wonder what the rent would be and what the inside looks like. Is George Clooney fading? I don’t think so. 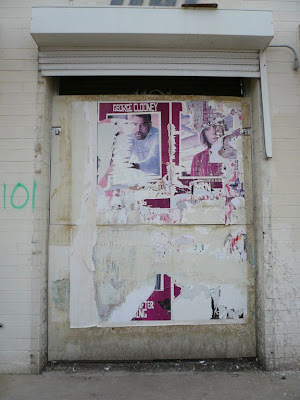 Even though the movie “Burn After Reading” was just released in mid September, these fading and torn movie posters make it look as though it’s a relic of the past. George, on the other hand continues to age gracefully. You have got to love those genes. 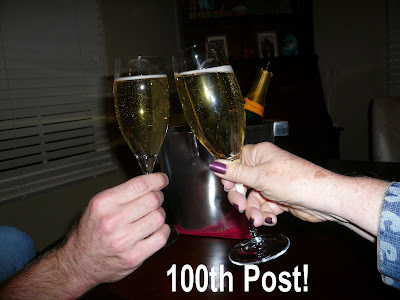 I'm celebrating today because this is my 100th post. I'd like to say just how much I have enjoyed doing this. I have been watching a variety of daily photo sites for the past 3 years and have loved seeing some fantastic photos and learning new things about places I've visited as well as about places I haven't yet had the opportunity to visit. When I first started, I was amazed at the things I learned about my city. But most of all, I've enjoyed getting to know all of my fellow bloggers and being a part of such a fun and diverse group of people. So, here's to the next 100 posts. Better yet, here's to the next 1000 posts! 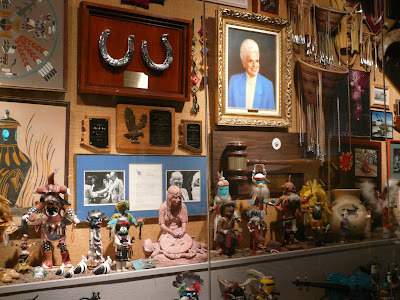 Inside the Arizona Mining & Mineral Museum that I featured on August 2nd, is a room devoted to former Governor Rose Mofford. Rose is a native Arizonan who graduated with the highest grade point average ever achieved at her school in northern Arizona. In 1939, she played first base for the Phoenix Queens a fast pitch softball team that toured all over the country and even played Madison Square Garden. She spent a lifetime working for Arizona State Government and was appointed Secretary of State in 1977 and remained in that position until 1988 when she became Governor after the impeachment of then Governor Evan Mecham (Arizona has quite a colorful political history but, that’s another story.) This room contains all sorts of memorabilia from her years in governmental service. This picture only shows a portion of one wall. There are two other walls all just as full as this one. The portrait in the center shows Rose with her distinctive white-haired beehive. If you happen to read Bon Appetit or Gourmet magazines or even the New York Times, you might have read that those publications have dubbed Pizzeria Bianco the “best pizza in the U. S.” This is quite an honor for a city that at one time was dubbed the chain restaurant and fast-food capitol of the west. 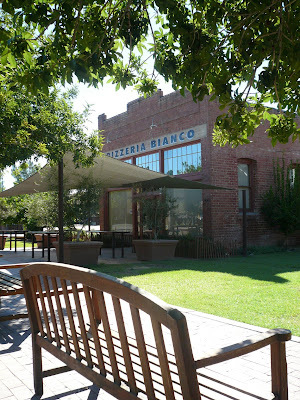 All pizzas at Pizzeria Bianco are cooked in a wood-burning brick oven by chef/owner Chris Bianco. The restaurant is very small, housed in a former machine shop built in 1929 and located on the Heritage Square site featured yesterday. I took this photo when the restaurant was closed because once it’s open, it’s very hard to see the front because of the all the people waiting to get in. They do not take reservations so you put your name on a list and wait. I’ve waited as much as 1 ½ hours for a table. Is it worth it? I guess that depends on your tolerance for waits and if you happen to wait at the wine bar next door, your tolerance for alcohol. That said, yes it does serve fantastic pizza. I’ve never been disappointed. 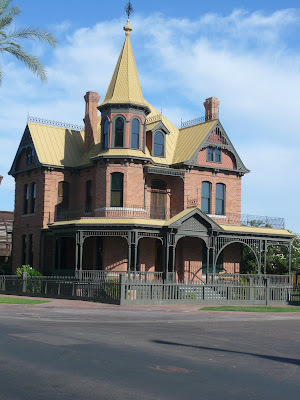 This Victorian home built in 1895 was part of the original Phoenix town site. It’s located in the heart of downtown Phoenix and has become part of Heritage Square, a collection of restored turn of the century homes located adjacent to the Arizona Science Center. Originally it was the home of Dr. and Mrs. Roland Lee Rosson and its construction set them back a total of $7,525.00. It was purchased by the city in 1974 and is now open for tours and as a setting for weddings. Tomorrow I’ll show you a restaurant also located in Heritage Square that has received national recognition. I made a second trip to the Monarch Butterfly display at the Desert Botanical Gardens. 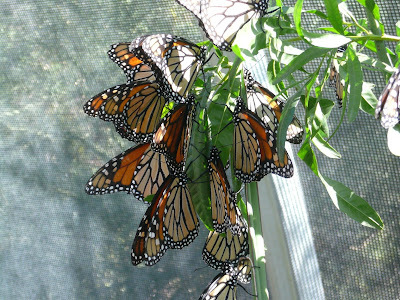 This is the fifth year that the garden has hosted the seasonal display with hundreds of Monarch Butterflies inside a pavilion especially designed for the exhibit. I went the first time about a week ago and it was still very hot weather so the butterflies weren’t very cooperative for a photo shoot. Over the weekend, the temperature dropped by 20 degrees making the afternoons perfect for being outside. The butterflies seemed to love the cooler weather too! They were a lot more active and very obliging to all the camera laden observers. Desert Botanical Gardens is another Phoenix Point of Pride. I'm sure I'll be featuring other pictures from this wonderful place in the future. Angie of Tempe Daily Photo has also been featuring some photos from the Monarch display. Check it out. On Saturday I went to a wedding in the little mountain community of Yarnell. 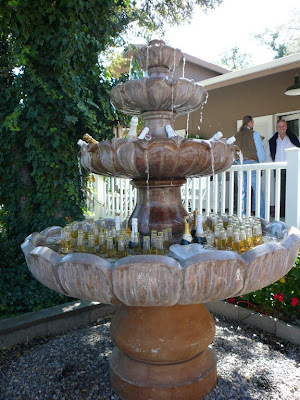 At the home of the event, the front yard fountain had been turned into a chiller for the reception beverages. What a clever idea and a fabulous use of space! This is the entrance to a brand new building located just west of the capitol. It will be dedicated on January 15, 2009 and named for Polly Rosenbaum, the longest serving Arizona legislator. Polly took over the House of Representatives seat occupied by her husband in 1949 when he passed away and she remained in the house for 45 years until 1995. She was dedicated to historic preservation so it is more than appropriate to name this building for her. Polly passed away in 2003 at the age of 104. So, if you can do the math, you will see that she served as a state representative well into her 90’s. I love the star and stripes displayed over the door to the building. 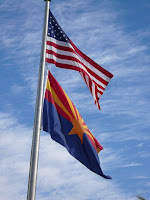 It’s a design that represents Arizona as you can see from the picture of the state flag at the left. There are dozens of species of prickly pear cactus growing in a variety of ranges and elevations of the American Southwest Deserts. They all have the round flat pads that serve several functions. The pads can store water, produce flowers, and perform photosynthesis. 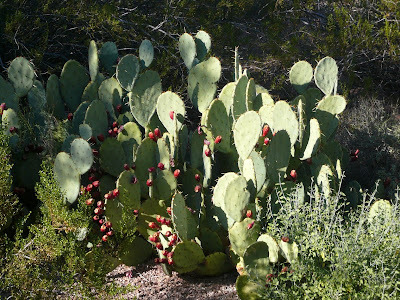 This cactus is laden with the edible red fruit used to make jellies, candies, and nectars. The flat, fleshy pads are also edible and sometimes are cooked in stews and other Native American dishes. There are ongoing studies of the medicinal benefits of this fruit producing cactus. It is believed that the fruit pulp helps to lower bad cholesterol while leaving good cholesterol levels stable. In another study, it is thought that it helps to lower the need for insulin in some diabetics. I’ve had the jelly and the candies made from the fruit and found it very sweet and quite good. I have never tried the cooked cactus pads. Obviously, harvesting the cactus requires some extra special care to keep from getting stuck by the needle-like spines on the fruit and the round pads. Sometimes the most mundane things can strike up a little spark in the right brain and cause you to react differently than you normally would. That’s what happened to me one day when I brought home the groceries and neatly placed the fresh fruit in a bowl that I keep on my kitchen counter. Looking at the bowl in front of me, I felt that little artistic flicker and the next thing I knew I was arranging the countertop for a photo shoot. 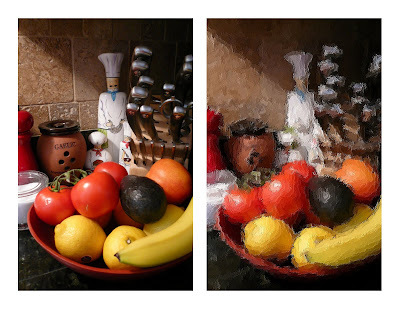 So here for your viewing pleasure is my little work of art, “Still Life Composed in the Kitchen”. It’s not Matisse, but I enjoyed the moment and the result. The one on the left is my original photo. On the right I did a little photo-shop magic. Which do you like better? 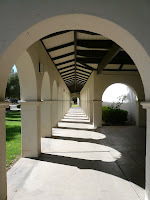 I live only two blocks from the growing campus of Phoenix College. I’ve walked by this piece of art many times, but because it’s always been early in the morning and I’m trying to keep a certain pace, I’ve never stopped to examine it closely. I’m glad I finally did. It’s a very interesting piece that anchors one end of the campus. The 10 foot high piece was a project sponsored by the college to create a piece of art that was relative to the surrounding community. 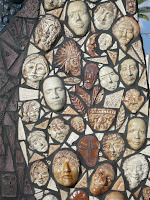 The name of the piece is “Faces of the Community” and embedded in the cement base are hundreds of masks depicting the diverse faces of the community surrounding the college. Contributing artists are Mike Anderson, Zarco Guerrero, known in Arizona for his masks, and Helen Helwig and Niki Glen. 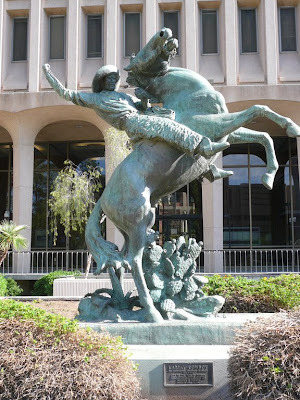 Located in a small plaza across the street from City Hall is this bronze sculpture called Lariat Cowboy. It was a gift to the city in 1934. The sculptor is Constance Whitney Warren. This is a bench at a bus stop in downtown Phoenix. 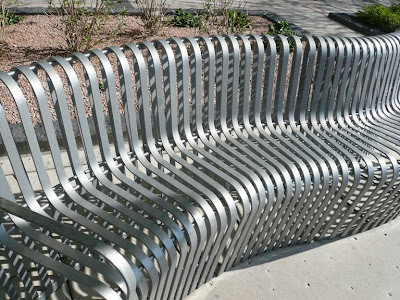 It wasn’t until I downloaded this photo that I began to wonder what it might feel like to sit on this bench around 3:00 PM on a sunny day in July with temperatures hovering around 110 degrees (45º C). I might have to test the bench for heat absorption the next time I’m downtown. Hopefully, it’s made of a heat deflecting material so that those using it won’t be permanently scarred. I’m following up on yesterday’s post with some art work from the Heard Museum. Above is a bronze by Doug Hyde called Intertribal Greeting. Doug Hyde is a very well known Native American artist living in Santa Fe New Mexico. He does sculpture in bronze and in stone. 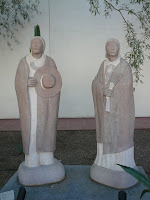 The smaller picture is of two stone statues by him also located at the Heard Museum. His sculptures are based on the stories his grandfather and other elders told him while growing up. The Heard Museum is a living museum that features both artifacts and contemporary art of Native cultures. 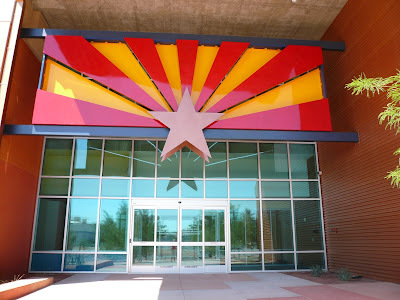 The museum’s overall mission is to educate the public about the heritage and the living cultures and arts of Native peoples, with emphasis on the peoples of the Southwest. It was founded in 1929 by Dwight B. and Maie Bartlett Heard to house their personal collection of art. 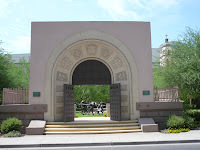 Much of the archeological materials on display came from the La Ciudad Indian ruin purchased by Heard in 1926 and located in the heart of Phoenix. The museum is recognized internationally for the quality of its collections and for its educational programs and festivals. The Spanish Market will take place in November and the World Championship Hoop Dance Contest will be in February the popular Indian Fair and Market will take place in March. Hopefully, I’ll get some picture from each of these events. The Heard Museum is another Phoenix Point of Pride. Standing on a corner in downtown Phoenix, I was struck with the variety of roof tops displayed in front of me. 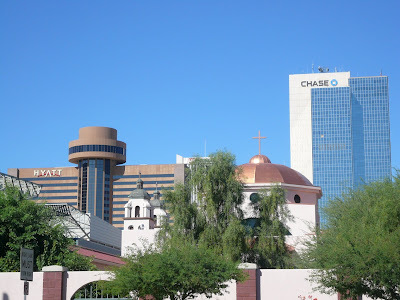 In this photo I can see the Hyatt Hotel with is revolving dining room on top, the two bell towers of St. Mary’s Basilica, The copper dome of the Phoenix Catholic Diocese Headquarters, and the tall Chase Bank Building. In front of St. Mary’s you see the flat roof line and steel frame of the new convention center. 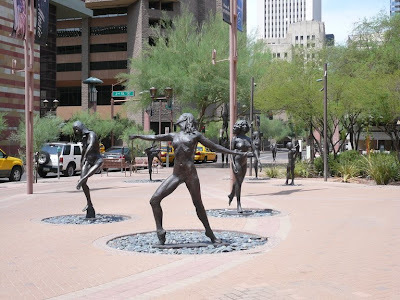 Located in front of the Herberger Theatre is a group of twelve larger-than-life bronze sculptures. 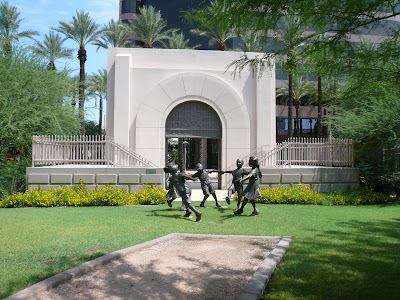 Artist John Henry Waddell created these sculptures for the city of Phoenix to be placed in front of the old Civic Plaza which was located in front of Symphony Hall. They were placed in that plaza in 1971 and remained there until construction started on a new convention center in 2006. They now adorn the open space in front of the theatre. 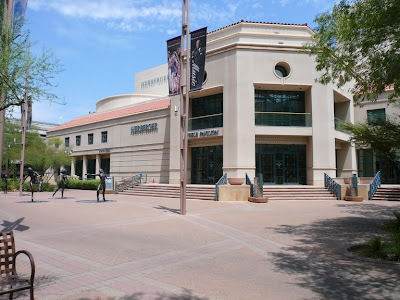 The Herberger Theatre was built in downtown Phoenix in 1989 containing 3 performance spaces, the main or center state seating 800, stage west seating 325, and a performance outreach space seating 110. A large portion of the funds to build the theatre came from Katherine “Kax” Herberger and her husband Robert who moved to Arizona in 1949 from Minnesota where they owned a department store chain. Kax Herberger devoted most of her life to the arts contributing both time and money to all aspects of the arts. 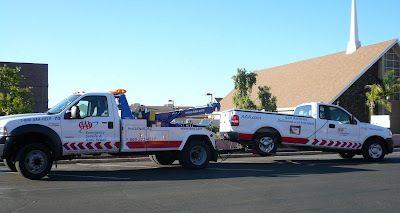 In addition to this project, she also contributed to The Herberger College of Arts at Arizona State University, the Phoenix Art Museum, and many, many other organizations. This is a beautiful theatre and is one of the Phoenix Points of Pride. This is also where I saw the performance of “Doubt” that I told you about yesterday. Here is Angelica Howland reviewing her lines before a performance of the play “Doubt” at the Herberger Theatre in downtown Phoenix. Matthew Wiener, the play’s director and April Smith, the stage manager were kind enough to let me back stage before a performance of this beautifully staged play written by John Patrick Shanley. Angelica gave a perfect performance playing Sister James as did the rest of the superb cast. Matthew is the artistic director for Actor’s Theatre, a company that is dedicated to providing theatre that is passionate, thought provoking, and designed to add to the social dialogue. The play “Doubt” certainly fills all of those commitments. Posted in the theatre lobby, was a dry-erase board where audience members could share their opinions about the play. By the time I left, the board was full of lines of dialogue representing the divergent views the play always elicits from the audience.